BRANSON, Mo. — Tommy Martin is spinning some of that old magic that has made him a 19-time Bassmaster Classic qualifier. The Hemphill, Texas, pro will turn 71 next month, but he has showed no signs of slowing down during the first two days of the Bass Pro Shops Bassmaster Central Open at Table Rock Lake. Instead, Martin is full of vim and vigor as he leads the event with 22 pounds, 5 ounces and is the only angler in the entire field to catch a limit each day. The first day he weighed in a 10-6 limit to move into 10th place and followed up with an 11-15 bag today to take the lead. The tournament veteran started out yesterday morning throwing a spinnerbait because conditions were ideal (windy and overcast) for a blade bait, but the pattern produced only one fish. “I made an adjustment and started fishing deep and caught four more,” he said. “Today I started out deep and stayed deep all day and had about eight keepers. I am fishing anywhere from 20 to 50 feet deep. Yesterday, when the wind was blowing, the fish were 20 to 26 feet and today they were 30 to 50 feet. Elite pro James Niggemeyer of Van, Texas, slipped from second to third place with 20-0, while Day One leader Robbie Dodson of Harrison, Ark., dropped to fourth with 19-13. 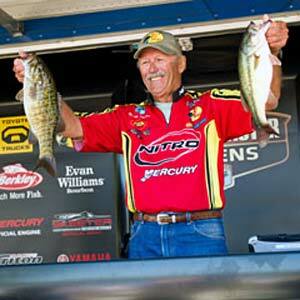 Elite pro Kevin Short of Mayflower, Ark., jumped into the fifth spot with 18-1. Catching three keepers weighing 7-8 moved Vincent Borrego of Scottsdale, Ariz., into the co-angler division lead with 9-8. Rounding out the top five are Stanley Grice, Kentwood, La., in second with 8-11; Jim Furr, Hemphill, Texas, third, 6-10; Clayton Coppin, Wagoner, Okla., and Allen Trillingham, Pineville, Ark., both tied for fourth with 6-7. Hosting this event is the Branson/Lakes Area Chamber of Commerce and Convention and Visitors Bureau. Tomorrow’s launch will be held at the Table Rock State Park Marina, 380 State Park Marina, Branson, Mo. The weigh-in will move to the Branson Landing water fountains near Bass Pro Shops in Branson, located at 1 Bass Pro Drive and will begin at 4:15 p.m. CT. Complete day two results are on the GreatLakesBass.com B.A.S.S. Forum.